Vole Magic Note lets you create and organizes multimedia notes with easy. You can integrate local disk image, audio, video and any other documents even online resources such as YouTube, Vimeo, Dropbox and even websites into your daily notes and enjoy them in the built-in media player. Vole Magic Note can create most professional note that allow users to create PageShare note. Each PageShare note is a complete HTML 5 website. Learn more about PageShare, you can see Vole PageShare. With PageShare, Multimedia Integration, Rich Text and Magic Touch, Powerful Search, Dock-tabbed window and six beautiful themes, Vole Magic Note provides you a new multimedia based most professional notes experience. The UI is completely unintuitive, the information is poorly tracked, the program is completely sluggish even with only text entered (no images, video, etc.) and only gets worse when you start adding those. I can’t get it to save as a note of a certain subject, only the date so I still have to keep track of a separate file/paper/etc. to know what date to go back to in order to get access to my notes again. It does let me enter data, save images in notes for reference, etc, but I could get that out of a Word Document. Keeping a diary means having a place to write down your thoughts, feelings, memories and personal impressions about life. This can be healing and teach you to know yourself better. In a similar way, notetaking has its own benefits too. It can improve focus and attention to detail, promotes active learning, increases creativity, and improves organization skills. Both of these activities were performed with pen and paper, but in today’s world, where we spent most time in front of a PC screen or a smart device, these activities are now performed using software applications. 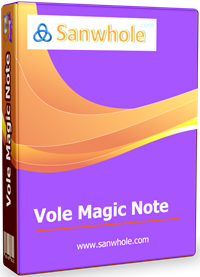 Vole Magic Note Professional LTUD is a note taking software application, that comes with many handy tools, to help make your note taking process easy and improve your overall experience. It allows you to write a diary and keep it secure on your computer, fill it with images, videos and hyperlinks, preview media, set reminders, and more. The installer size is ~80MB and the installation process is simple and straightforward, taking no time at all to complete. To get the license and activate the application you first need a Sanwhole account, where you can import purchases using the codes. You can then download license file in TXT format to your PC. This file can be activated inside the software easily and quickly. Once done, you can start using the application and all the tools that it comes with, to create notes that are actually useful. The UI of the application is divide into different panes, and has an old and outdated look to it. You do have option of 6 themes to choose from to suit your needs. At the top you have buttons to different options and tools. On the left you can view all your notes and search for them. The bigger box on the top shows content, while the other one shows the media content selected. The UI is not intuitive but you can load a sample to help you get started. Moreover, you can use the help documentations if any help is required. – Create and organize multimedia containing notes with ease. – Create Pageshare notes, each note is a complete HTML5 website. – Integrate in notes audio, video, and other online resources. – Add Rich Text, images and hyperlinks. – Powerful search function to search for notes with ease. – 6 different themes to choose from and ability to change the language of the UI. – In-built media player to preview media content. – The UI looks old, outdated, and is not intuitive. This makes it difficult to use and understand. Vole Magic Note Professional LTUD is note one of the best note taking application out there, but it is definitely an application that can be used on daily basis once you get used to it. It comes with many handy tool, the application runs smoothly and lag free. It is worth-trying.